Keyword discovery is one of the most important parts of any search marketing initiative. You need to find relevant keyword opportunities to use on your site and in your pay-per-click advertisements so you can attract search engine users who are likely to become customers. But negative keyword discovery is equally important, because it prevents advertisers from wasting ad spend on keywords that aren't relevant to their business or their audience. Negative keywords offer an opportunity to strategically restrict your PPC advertisements, so they only reach your best potential audience. Create More Relevant Ad Groups – By weeding out keywords that aren't related to your business, you tighten the relevance of your ad groups. Small, closely related ad groups allow you to craft a single message that speaks to the entire group of keywords. Save Money – By avoiding paying for useless clicks, you save a lot of money. Additionally, by creating more relevant keyword groups with higher CTR, you raise your Quality Scores, which will also lower your costs. So what exactly are negative keywords, and how can they save you money and improve your ad campaign performance? They Serve as an Ad Filter – Creating a negative keyword will ensure that your ad doesn't show for that particular term. They Apply to Expansive Match Types – Negative keywords are useful when applying phrase or broad match (or a similar expanded matching option, such as Yahoo's advanced match), as opposed to exact match (which only matches your ad to an exact keyword phrase you specify). When using broader match types, your keywords are matched to multiple variations of a phrase, not all of which will be logical extensions of the phrase you're targeting, and not all of which will be pertinent to your business. Why Use the Broad Match & Negative Keyword Combination? So why not just use exact match and show only for the specific keywords you want to target? It Limits Your Reach – While broad and phrase match will sometimes display your ad in response to unwelcome keyword variations, they also help your ad display against highly valuable permutations of your keyword—variations that you wouldn't be able to anticipate. (About 20% of search queries have never been searched on before!) In fact, limiting yourself to exact match causes you to leave most of the traffic on the table, as it ignores the long tail. The Costs Are Higher– "Head" or broader terms have greater advertiser competition and typically cost you more per click than more specific variations. The ideal solution is to utilize broad or phrase match while mining your account for negative keyword candidates. This way you can cast the widest possible net, but filter out potential matches that you know won't convert. So you want to implement broad and phrase matching options to capture more traffic, but how do you combat irrelevant clicks and impressions (and uncontrolled ad spend)? Learning how to find negative keywords can be difficult. Many new online marketers wonder how to get negative keywords. Historically, discovering negative keywords and building a negative keyword list has been a laborious and faulty process, involving sitting around and brainstorming (which only gets you so far) or poring through search query reports in Google AdWords. But AdWords offers limited visibility into what the queries your ads are being matched against. In addition, it's a very slow and annoying process to go through each query one by one, picking outAdWords negative keywords. But let's say you take the time to do this and compile a list of undesirable queries. What do you do then? How do you designate what are negative words? It's Time-Consuming and Manual–You end up spending a massive amount of time pulling reports, slogging through analytics, manipulating the data in Excel, then going back to your account to implement the changes. It's Static – New searches are triggering your ads all the time; you'll have to repeat this process frequently to stay on top of wasteful spending. The Process Itself Is Redundant – Pull a search query report for your account, and you'll see a lot of keywords that are generating relevant clicks. Why bothering to go through the good stuff every week? Ideally, you'd have a report that shows you only queries you haven't reviewed yet. Efficiently manage negative keyword research by using the same tool to find, review, and add negative keywords and upload changes directly to your AdWords account. When you enter a keyword in the Free Negative Keyword Tool, it mines our massive keyword database of more than a trillion search queries for modifiers that may not be relevant to your offerings, creating a negative keyword list. Once your list of negative words has been generated, you can then review these terms and tell the tool whether or not they are relevant to your campaigns. For example, if you own a stationery business, you might want to create an ad group to sell notebooks. The Free Negative Keyword Tool suggests clusters of terms that may trigger your "notebook" ads. As you can see, most of the terms are related to notebook computers, not spiral notebooks! You wouldn't want to bid on these computer-related terms. It would be a total waste of your ad spend. To eliminate these keywords from your campaigns, simply click "no" to add a negative keyword term to the list of negative keywords in the right-hand pane. Once you upload your list to AdWords, you can rest assured that those queries won't match against your ad in the future—and they won't cost you a cent. Broad match means that any search queries containing the words "hard" and "drive" will be filtered out. Phrase match means that any queries containing the phrase "hard drive" (in that order) will be filtered out. Exact match means that only the exact query "hard drive" will be filtered out. You can also set terms as positives by clicking "yes" in the review pane. This ensures that keywords that are relevant to your business don't end up on your negative keyword list. You can always review your negative keyword lists later and eliminate negative words that you no longer want set as negative keywords. The Negative Keywords Tool offers expert keyword research, providing a free online list of negative words for your business. 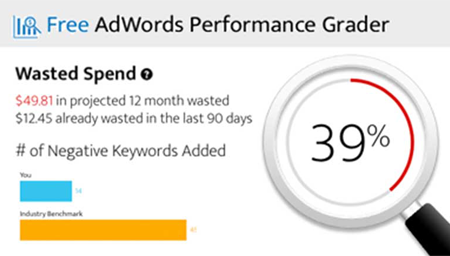 Utilizing your list of Google negative keywords in AdWords helps save you advertising money, drastically improving your ROI. To learn more about the Free Negative Keyword Tool and how it works, visit the frequently asked questions (FAQ) page. With WordStream's Negative Keyword Tool, finding negative keywords has never been easier.